Dimensions: 1/2”, 2”, 3”, 4”, 6”, 8”, 10”, up to 24”. Class range: Class 150 to 2500(# or LB). PN 2.5 to PN 250. 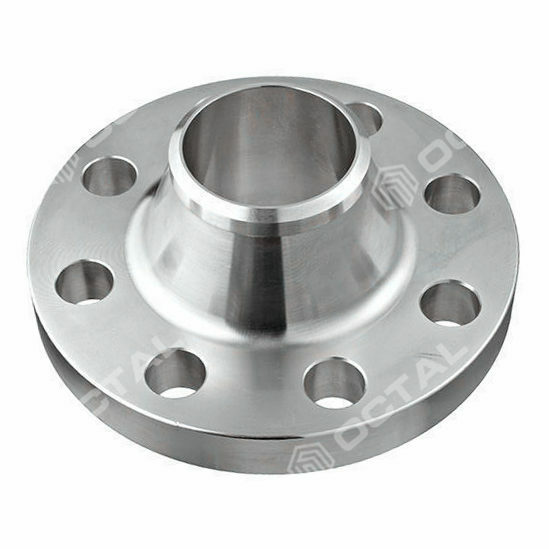 A weld neck flange, also called a tapered hub flange or high-hub flange, is a kind of flange that can relocate stress to the pipes, ensuring a decrease in high-stress concentration at the bottom of the flange. There are two welding neck flanges designs – the first type is used with wipes while the second, longer type cannot be used with pipes but with a process plant. The weld neck flange comprises of a round fitting that extends beyond the rim of the circumference. These flanges, typically manufactured from forging, are actually welded to pipes. The rim has numerous holes drilled into it that enables the flanged to be attached to a bolted flange. This design is far better because of the structural valve. 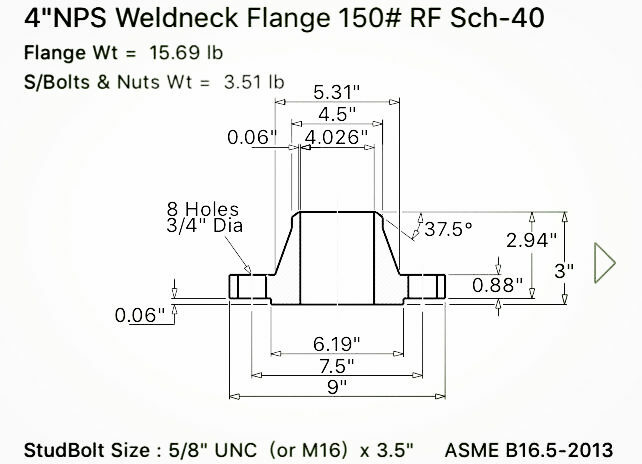 Long WN flange looks like the typical welding neck flange, but is considered to be elongated. It’s usually used as a nozzle for a column or barrel. You can also choose between the Equal LWN Barrel and LWN Heavy Barrel, which have a thick wall and their own shape. It is also called reducing welding neck flange, because the flange neck has a reducing diameter that to weld to a smaller diameter pipe. 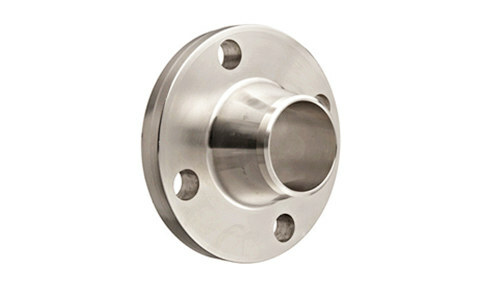 This flange type is regarded as high-hub flanges, which were created so stress could be transferred to the pipe and decreasing the stress concentration at the bottom of the flange. The Welding neck flanges are available across various materials. These materials will have to be as per the Standards set. The materials also should be as per the quality specified by the ASTM or ASME standards. However, the thickness and the inner diameter of the flange will be as per the size of the pipe for which this welding neck flange is being made. 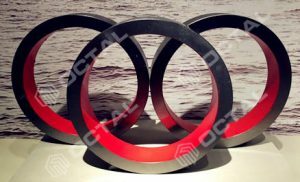 Talking of the materials, Carbon alloy is a popular choice of material used to make these flanges since they are also resistant to extreme temperature. It is available in materials of ASTM A 181, and ASTM A 105. 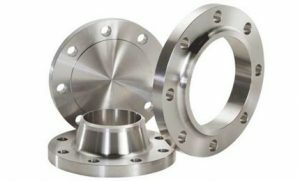 The flanges are available in various grades like ASME B16 47 ‘A’ Series, and ‘B’ Series to suit the needs of the clients and the industry. Other than this material, Welding neck flanges are also in Stainless steel. 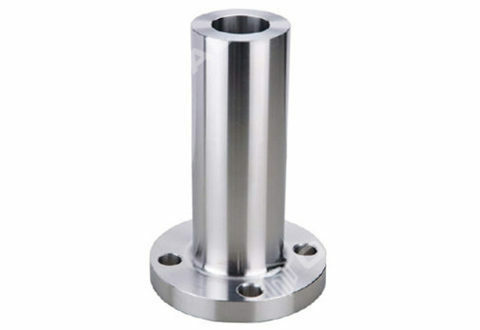 The flange is made of ASTM A182, F304, 316L, 347H, 310S, ASME B16 5, and comes in a duplex steel finish. 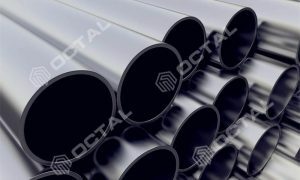 The duplex steel material of UNS S31803 is also in use. Besides stainless steel, the welding neck flange is available in various other materials like Carbon alloy and nickel among others. The Nickel alloy welding neck flange is available in the Inconel 600 and 625, Hastelloy C22, C276 and other such materials. 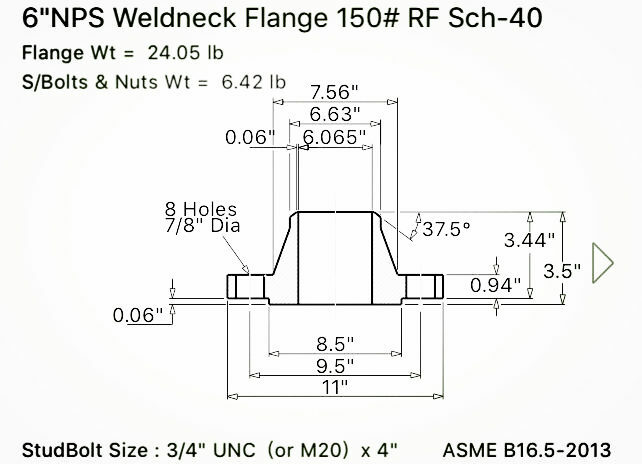 Below we list some sizes of weld neck flanges (Class 150) under ASME B16.5 (1/2” to 24”). · The 1/2” NPS weldneck flange has inside diameter of 0.62” and outside diameter of 3.50”. The raised face’s thickness is 1.88” with four holes for bolts. · The 3/4” NPS flange has inside diameter of 0.82” and the outside diameter of 3.88”. The raised face’s thickness is 2.06” with four bolt holes. 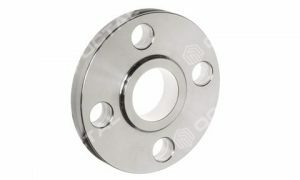 · The 1” NPS weldneck flange has inside diameter of 1.05” and outside diameter of 4.25”. The raised face’s thickness is 2.19” and the standard bolt holes are four in a number. · 2” NPS weldneck Flange has inside diameter of 2.07” and outside diameter of 6.00”, The raised face’s thickness is of 2.50”. · The 5” NPS Flange has 5.05” of inside diameter and the outer diameter is of 10.00”. The thickness of the raised face is 3.50”. · The 6” NPS Flange has 6.065” of inside diameter and the outer diameter is of 11.00”. The thickness of the raised face is 3.50”. · The 10” NPS flange has inside diameter dimension of 10.02” and the outer diameter of 16”. The thickness of the raised face is of 4.00”. · The 20” NPS flange has inside diameter of 19.25” and the outer diameter of 27.50”. The thickness of the raised face is 5.69”. 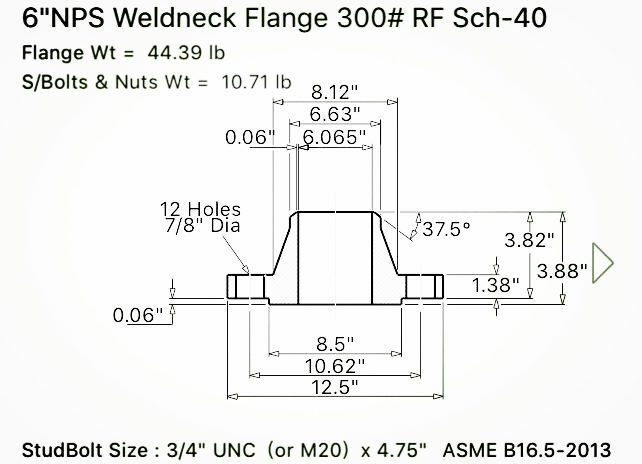 · The 24” NPS Weld neck flange gets the interior diameter of 23.25” and the outer diameter of 32.00”. Class range: Class 150, 300, 400, 600, 900, 1500, 2500(# or LB). PN 2.5 to PN 250. ASTM A105 for carbon steel welding neck flanges. Prior to ordering the weld neck flange, the companies shall need to confirm the material standard, outer diameter, pressure class, face type and thickness schedule.